The struggles of Hawaii's visitor industry and projected reduction in fall bookings have prompted hotel executives to seek emergency aid from the state. Local hoteliers, who expect to see a 10 percent to 30 percent year-over-year drop in fall bookings for the industry's bread-and-butter hotels, plan to ask the Hawaii Tourism Authority for emergency action, including special marketing programs and working with airline partners, at the next annual board meeting Tuesday in Waikiki. Consumer confidence in the U.S. economy, which is reportedly at its lowest level since the 1980s, has taken a toll on all long-haul destinations, especially those that are luxury-branded like Hawaii. As concerns rise about prices and the economy, more travelers are choosing to stay closer to home and the big spenders are pulling back. The projected soft bookings for the typically slow fall season are expected to be much more serious than the market conditions following the Sept. 11, 2001, terrorist attacks, according to tourism officials. Correcting the current situation "will require very aggressive action to avoid major job and revenue impacts," said David Carey, Outrigger Enterprises Group chief executive officer. With current passenger counts for Hawaii's struggling visitor industry fading faster than a summer tan and fall bookings projected to fall across the islands, Hawaii's hoteliers say the state must intervene. Hotel executives, who expect to see a 10 percent to 30 percent year-over-year drop in fall bookings for the industry's bread-and-butter hotels, plan to ask the Hawaii Tourism Authority for emergency action at the next annual board meeting Tuesday in Waikiki. While the state already has allocated more than $3 million in emergency funds this year to drive business after the closures of Aloha Airlines and ATA Airlines, Hawaii hoteliers are saying more needs to be done now if the destination hopes to hold its own. "Everyone is batting down the hatches and I think it could get worse," said Jack Richards, president of California-based Pleasant Holidays LLC, Hawaii's largest wholesaler. "July is the peak season, so if Hawaii is experiencing these kinds of declines now, it doesn't bode very well for the fall." While Hawaii's visitor industry has struggled before, especially right after 9/11, few Hawaii hoteliers can recall a time when visitor counts and projections looked so bleak, Richards said. "This just might be the worst that it has been," he said, adding that it's not a good sign when even the nation's wealthiest people are withholding their spending as evidenced by recent drops in Hawaii World, Pleasant's luxury brand. That's why Keith Vieira, senior vice president of operations for Starwood Hotels & Resorts in Hawaii and French Polynesia, is planning to join forces with Outrigger Enterprises and other Hawaii hoteliers to ask the state to help its key industry stem the losses. "Maui's occupancy is down by 30 percent. The last time that I saw occupancies in Maui this low was 30 years ago," Vieira said. "The problem is huge and we need to make sure that the Hawaii Tourism Authority understands its magnitude. We need to come up with a forward-looking plan." David Lewin, general manager of the Hyatt Regency Waikiki Beach Resort & Spa, expects a definite 10 percent reduction in fall bookings because of rising gas prices, an unfavorable stock market and struggling economies throughout the world. Hotel executives have been proactive in catering to the market with special deals and substantially lower prices, particularly for the fall, but that won't prevent a downturn in Waikiki, Lewin said. "Let's be realistic: No amount of advertising is going to fix the economy or make the price of a gallon of gas go down," he said. "It's going to get ugly before it gets pretty. It's just a matter of severity." 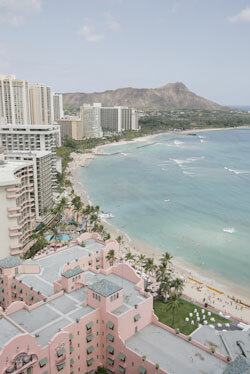 The concerns of Hawaii's hoteliers have not fallen on deaf ears. While the topic has not been added to the next Hawaii Tourism Authority agenda, State Tourism Liaison Marsha Wienert said fall's softness is a big issue. "It's not on the agenda, but I believe that it needs to be discussed," Wienert said. The HTA itself is projecting a 10 percent to 15 percent reduction in fall bookings statewide and a much more serious situation than the market conditions following the Sept. 11, 2001, terrorist attacks, said Rex Johnson, HTA executive director. (Sept. 11) "was a shorter-term thing," he said. "This is much more serious. We're going to have a tough year, no question." Hawaii's visitor industry saw improvement after the Hawaii Visitors and Convention Bureau launched a $3 million emergency marketing campaign this spring and hoteliers cut rates to stimulate travel, Wienert said. The HTA could release more emergency funds or reallocate its budget to address current challenges, she said. The tourism agency also is in discussions with additional air carriers interested in entering the Hawaii market by year's end or the first quarter of 2009 and has implemented special programs to stimulate short-term and long-term business, said David Uchiyama, HTA's vice president for tourism marketing. But in the end, Hawaii's tourism leaders might find that they cannot address all market vulnerabilities. "There's nothing as an island, as a government or anything else we're going to do about gas prices," Lewin said. "When Vegas is scrounging for business, you better believe Hawaii's going to get hit."